The traditional and the modern mingle on the first day of the Spirit of Speyside Whisky Festival, taking in food pairing, castles, the benefits of family ownership and a little dancing. Becky Paskin reports. There is a mezzanine-level bath in my hotel room, and six remotes controlling everything from mood lighting and window blinds to an electronic fireplace and a hidden TV installed in the end of my bed. I love technology, but this is ridiculous. The Station Hotel in Rothes, recently refurbished by new owner Forsyths – the coppersmith that creates many of Scotland’s stills – is my home for the duration of the Spirit of Speyside Whisky Festival (SoSWF), and a contemporary masterpiece. The hotel was built in 1901 on the site of a church and school to accommodate the wealthy while they fished for salmon in the River Spey. Since then, it has lived through many incarnations and under several owners until the Forsyths had their vision for what is probably the most unobtrusively techy building in Speyside. This fusion of heritage and modernisation was a recurring theme throughout the opening day of the SoSWF as the whisky industry endeavours to attract a new style of whisky consumer while retaining its traditional personality. For starters, a Cragganmore food pairing event, hosted at the Ballindalloch site by distillery manager Kevin Innes, featured only one chocolate dish. Those with a sweet tooth look away now, as while many Scottish distillery visitors are familiar with whisky and chocolate tasting sessions, sausage and whisky may seem somewhat unconventional. Cragganmore’s fruity and dense, meaty character lends itself to meat pairings, and a chicken liver pâté went wonderfully with a Cragganmore 12-year-old (so I’m told. This seminar was not for vegetarians). For a 150-year-old distillery that’s retained the same unique still shape installed by founder John Smith in 1869, creating such food pairings is one way Cragganmore can keep with the times. After a boozy breakfast it was onwards to lunch at the sublime 16th-century Ballindalloch Castle with current laird Guy Macpherson-Grant. 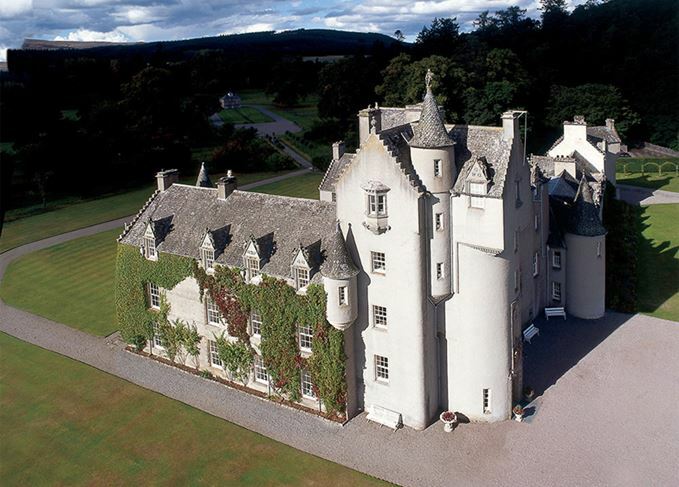 The family opened the castle to visitors 20 years ago, running their home as a tourist attraction alongside a farm, golf course and now whisky distillery as a means of income. It was a conversation between Macpherson-Grant’s father, Oliver, and Richard Forsyth (the coppersmith) over a round of golf that set the idea for Ballindalloch distillery in motion. Here the traditional truly does meet the modern, as while the distillery is just two years old and fitted out with the latest equipment, it’s set up to create a traditional style of spirit – wooden washbacks, hand pumps, worm tubs – and is located in a 19th-century farmstead. I continued in the same direction toward Glenfarclas, which with its long history of family ownership was offering a heritage tasting tour and a sample of the exclusive 2016 SoSWF bottling. As my tour group pottered around the still room, export sales director Myriam Mackenzie explained the Grant family’s involvement with Glenfarclas, from John Grant’s purchase of the distillery in 1865 through to the mid-1980s, when John Grant (fifth generation) defied an industry slowdown and increased production. As other distilleries struggle to meet demand for aged whisky, John Grant’s foresight means Glenfarclas can release festival bottlings like this year’s 1989 single cask with nae bother. It’s a true Glenfarclas Sherry bomb with balanced, rich dark fruits and oak, with a long, succulent finish. The price? A steal at just £150 per bottle. There is only one way to round off a day exploring Speyside and that’s with more food and whisky, and a ceilidh. Hosted again at Auchroisk distillery, the ceilidh is an opportunity for both consumers and the industry to mingle and share stories of their day over a few drams and a dance. Perhaps the most traditional event hosted during SoSWF’s opening day, but some customs die hard. I took my leave as the Gay Gordons was starting up. After a day like that, the comfort of my mood-lit hotel room and thoroughly modern, handmade Hypnos bed was too tempting. More from Becky and Dave at SoSWF tomorrow, including bespoke whisky blending, a Sherry masterclass with Charlie Maclean and The Blackening. The spring chill at the start of this year’s festival can’t mask the gathering’s huge warmth. Scotchwhisky.com’s chief engineer has been recognised for his contribution to the whisky region. Expect the unexpected on SoSWF’s second day, from blends to blackenings and desert island drams.